The one I’m most interested in is 17094, which is to rezone the property at 12302 and 12308 Jasper Avenue from CB1 to CB3. The proposed opportunity is a mixed-use development up to 14 storeys in height. Currently at that location you’ll find the Peter Robertson, Agnes Bugera, and Front art galleries. Also on March 2 is the City Manager and City Auditor Performance Evaluation Committee meeting. There are two private items on the agenda – 2014 Evaluation Results and 2015 Evaluation Process Update. The meeting is scheduled to take place over the lunch break. There’s also an LRT Governance Board meeting taking place on Monday in the River Valley Room. The board will be receiving a verbal update on the Valley Line LRT Project, and the board’s Semi Annual Report will be discussed (it’ll need Council approval). There’s also a report outlining the results of the Public Input on Request for Proposals for Stage 1 of the Valley Line LRT. Next up for Council is a regular City Council Meeting that starts Tuesday and may run into Wednesday. There are 19 reports on the agenda, 13 of which are committee reports. There are also 18 bylaws on the agenda for consideration. The highlight? “Economic growth will continue in Edmonton and out perform the rest of the province due to its relatively low direct dependence of the energy sector.” Longer term, Edmonton’s economic growth should recover to levels slightly above 3%, which will still be higher than most of the Province and Canada as a whole. Another round of forecasting is being planned for mid-April to take the Provincial budget into account, among other data updates. Preliminary results for 2014 tax-supported operations identify a net favourable year-end variance of $9.9 million or 0.5% of the overall expenditure budget. Based on borrowing and repayments to December 31, 2014, the City has $2.823 billion in total debt, which is 61.1% of the MGA allowed debt limit. The Quarters CRL ended 2014 with a deficit of $3.6 million and a cumulative deficit balance since inception of $9 million. The Belvedere CRL ended 2014 with a deficit of $1.6 million and a cumulative deficit balance since inception of $5.4 million. An increase of $3.6 million to the 2015 Operating Budget, with the funds to come from the Financial Stabilization Reserve. An increase of $5.1 million to the 2015 Operating Budget, offset by an equivalent transfer from amounts currently appropriated in the Financial Stabilization Reserve. An increase of $39.5 million to the 2015 Operating Budget, offset by an equivalent amount in revenue, to address the cash flow of expenditures for the 41st Avenue/QEII interchange. The financial results outlined in the report are based on information available to February 23, 2015 and are unaudited and subject to change. The unused capital budget will be carried forward, a process that is expected to be finalized in the spring. This report, along with the associated Department and Branch 3-Year Business Plan Process report, outlines the Implementation Project for The Way Ahead. Last year Council reaffirmed the strategic plan with 12 revised corporate outcomes and 26 outcome measures. The scope of the project is to identify and prioritize actions and tactics to achieve or make substantial progress toward the outcomes by December 31, 2018. Branches are currently developing their 2016-2018 business plans now, which will include actions that contribute to the Implementation Project. 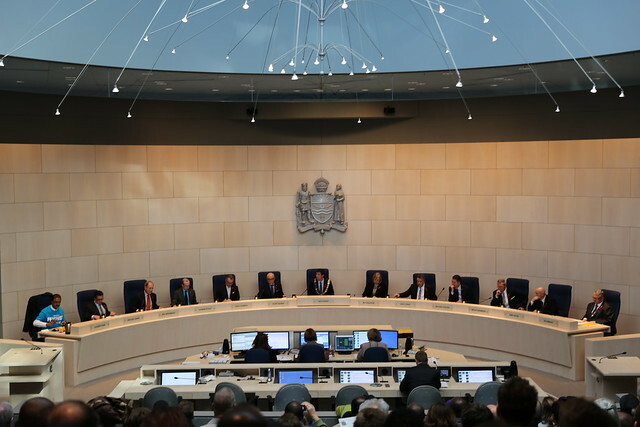 By April, the public will have been consulted through the Edmonton Insight Community, and by May the Corporate Leadership Team will have reviewed the Branch business plans and approved the Implementation Plan document. We can expect a public release of everything on November 3, in time for the 2016 budget cycle. This item will likely be just a rubber stamping exercise. Designation, Preservation and Restoration of McDougall United Church – A recommendation that the Mayor, on behalf of City Council, approach the relevant provincial ministers to explore partnership opportunities around heritage, arts and post-secondary uses as part of a repair and long-term operational sustainability strategy for McDougall United Church as a public building. Online Voting – That the Mayor, on behalf of City Council, write a letter to the Minister of Municipal Affairs requesting that consideration be given to amending the Local Authorities Election Act, to permit alternative forms of voting. ParkPlus Software Licensing & Maintenance Agreement – That the name “EPark” and the EPark design contained in the February 25 Transportation Services report be approved for use to distinguish parking solutions provided by the City of Edmonton. Funding Strategies for Future LRT Expansion – That Administration work with the Mayor, to develop a communication plan to inform citizens about the impact of other orders of government on funding the City’s future LRT Network Plan, in light of the upcoming Provincial and Federal elections, and return to City Council. Bylaw 17003 would designate the Mountfield House, built in 1905, as a Municipal Historic Resource. This is ready for third reading. Bylaw 17092 will amend the Quarters CRL bylaw to increase borrowing by $44,345,000, to pay for the phase II projects. That’ll bring the total for projects in the Quarters CRL to $95,345,000. This is ready for second and third readings. Bylaw 17075 will increase borrowing authorization for the Great Neighbourhoods Initiative by $60 million. This is ready for second and third readings. Bylaw 17102 will authorize the City to borrow $304,186,000 to undertake, construct, and finance Sanitary and Stormwater Drainage projects. This is ready for first reading only. Bylaw 17100 will authorize the City to undertake, construct, and finance the Downtown CRL projects by increasing borrowing authorization by $78,178,839. This is ready for first reading only. Bylaw 17004 will amend the Public Places Bylaw to provide the necessary legislative authority to prohibit smoking in Churchill Square. This is ready for third reading. There is one notice of motion pending which is Councillor Henderson’s motion regarding the planned elimination of the use of herbicides on public land. There will also be one private verbal update, on the purchase and sale of land in The Quarters.